Has there yet been a remake of a genre classic that’s better than the original? 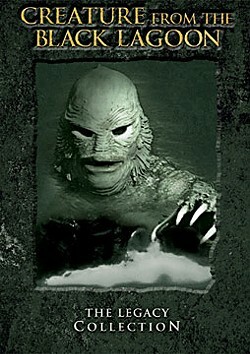 Now they’re trying it with Creature From the Black Lagoon, slated for release next year. Do yourself a summertime favor and see all three Creature features from the 1950s, on this nifty two-disk set from Universal’s Legacy Collection series. Radio actor (The War of the Worlds) and movie producer William Allard was at a dinner party with Orson Welles where someone told the story of a prehistoric man with gills like a fish who emerged from the Amazon River once a year to take a village maiden. Allard created the gill-man, and Universal released three films about him in rapid succession from 1954 to 1956 to take advantage of the short craze for 3-D. Now they’re preserved in glorious black and white as icons of a 1950s monster genre, and as still-fascinating movies for an age just as roiled in conflicts of humanity and nature, and the role of scientists between them. Creature from the Black Lagoon was directed by Jack Arnold (the most cerebral and creative in ’50s genre films) and starred Richard Carlson as the Good Scientist and Julie Adams as the Girl Scientist. On the basic level, it’s a thrilling monster movie, which these ’50s directors at their best knew how to make — how to pace, how to reveal, use music and so on. And the gill-man is a unique creature still. Knowing it would use the footage for more than one film, Universal splurged on underwater scenes, and these remain mesmerizing. Arnold returned to direct Revenge of the Creature, with a different long-legged beauty, Lori Nelson. Even at the time, Allard and Arnold were aware of the mythic and even political dimensions of the underlying themes in these films. Though Richard Denning plays Carlson’s human rival for the girl in Black Lagoon, the main sexual tension is between the creature and the lovely Julie Adams. The film’s most famous scene is an extended water ballet with Adams swimming on the surface in a bathing suit that accents her long legs, and the monster matching her movements underwater. It’s Beauty and the Beast as a watery King Kong, in the depths of desire. Another enduring theme of special interest in the Bomb-conscious ’50s was the proper role of science and scientists. In the first film, Carlson wants to study the creature in its habitat, while Denning wants to capture it and make money. In the second film, the creature is captured, and amidst the mayhem at a Florida marine park, this film accelerated an almost subversive examination of the dark sides of science. Conditioning the creature becomes tantamount to torture, and the monster finally rebels. Though the third film, The Creature Walks Among Us (directed by Jack Sherwood), is pretty low-budget and almost entirely recycles underwater scenes from the previous two, the story and acting are very edgy. There’s even a subplot of spousal abuse. The gill-man is again captive, and eventually is altered surgically to save its life. But with its gills removed, it can’t return to living in the water, while it’s still a monster on land. The DVD extras are fun — the gill-man has quite a cult. The Black Lagoon commentary by film scholar Tom Weaver is the most informative, but Julie Adams and Lori Nelson have some interesting things to say.